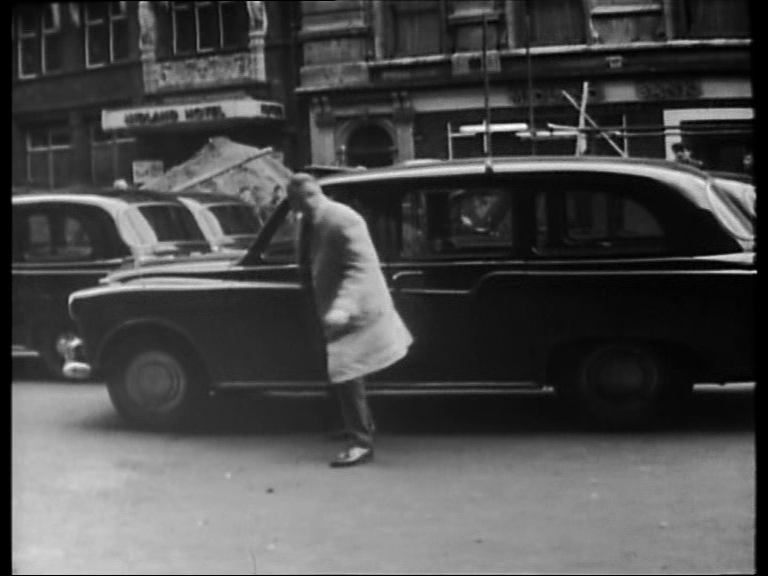 Few major British television drama series of the 1960s have a worse survival rate than that of the first three series of Public Eye (ABC, 1965-68/ Thames 1969-75). Of the 41 episodes of the first three series made by ABC, only five survive, which have just been released on DVD by Network (the four later series made by Thames thankfully survive in their entirety). Much of the reason for Public Eye’s poor archival status must lie in the sort of programme that it was, recently described by Dave Rolinson as “a magisterial detective-based drama (…) which got huge ratings for many years with its alliance of inventiveness, character focus, an unconventional lead and sometimes minimalist narrative”. 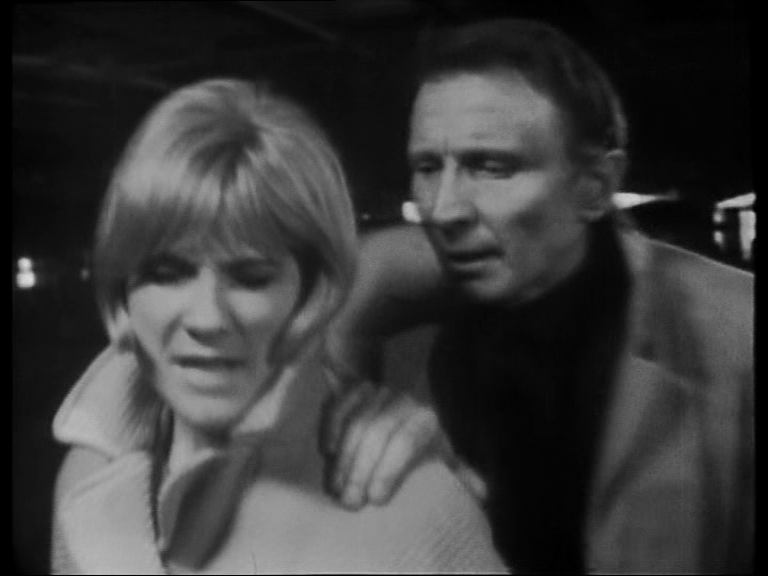 A downbeat series about the cases taken on by a shabby enquiry agent (Frank Marker, played by Alfred Burke), the concerns of Public Eye seem low-key and parochial in comparison with ABC’s great success The Avengers, and achieved little in the way of equivalent cult status or international commercial export. Similarly, popular crime series were commonly held in lower esteem than other, more apparently ‘authored’, forms of drama such as the single play, hence the much greater retention of contemporaneous ABC Armchair Theatre plays. The paucity of surviving material from the original Public Eye series makes attempting to imagine what these lost programmes must have been like an archeological process in reconstructive imagination. As even the camera scripts don’t appear to still exist, such patchy sources as a few press cuttings and the Public Eye novelization have come to hold disproportionate weight. But one extra on the DVD set provides a remarkable insight into the conditions of Public Eye’s recording and how they affected the form that the programme took onscreen. 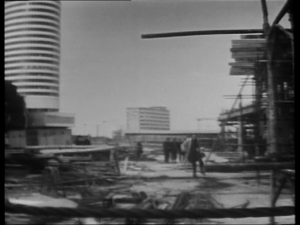 Although the second series episode ‘You Can Keep the Medal’ (30 July 1966), does not survive, footage of it being recorded on location in Birmingham does, in the form of a five-minute feature recorded for the midlands local news programme ATV Today, transmitted on 3 June 1966. 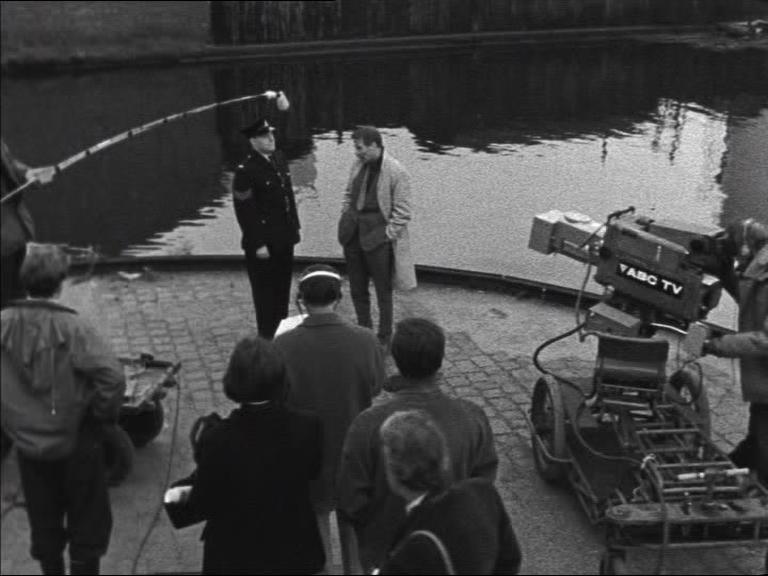 The feature consists of a scene of an encounter between Marker and a policeman (Timothy West) by a canal being recorded by an Outside Broadcast unit, the director making suggestions for a retake and an interview with Alfred Burke during a snatched tea break. Burke’s reflections about the value of different forms of TV recording are pertinent, and when viewed alongside another episode from the same series, the feature helps the viewer to understand why Public Eye took the form that it did, and the qualities that were particular to the programme. Birmingham hasn’t been exploited on the television screens. In fact, it hasn’t been seen to my knowledge. A big city, with all the sides of life that it contains – the sordidness and the squalor as well as the smart residential areas – is the sort of area in which Marker operates and gets most of his employment. Well, naturally it’s a different thing. Working in the studio, everything is much more under your control. On the other hand when you’re out here everything is real, you’re enabled to be a great deal more spontaneous because you’re in a real street, by a real canal, or on a real farm, as we were yesterday. Much (but perhaps not all) of the location footage for Public Eye‘s second series appears to have been shot on Outside Broadcast equipment, meaning that it was recorded electronically onto videotape by a similar process to the one in the multi-camera studio, with the signals from the cameras on location being relayed by cable to a director sat in a mobile recording van, who would mix the images in the same way that he would do in the television studio gallery. It’s going very well. It’s going the way it always does – a great deal of hanging about. The trouble with doing filming for television is that it’s alright when you’re actually doing it, but in the meantime it’s cosmically boring, because you have to do your own standing in and you’re usually standing in for your own left ear, or you’ve got to change your position and you find your foot’s in a hole or something of that kind, and the director – who is sitting 500 yards away in a mobile recording van – can’t understand why you can’t get the right position, you have to tell him that you’re half way up a mound of earth or something, but otherwise it goes alright. 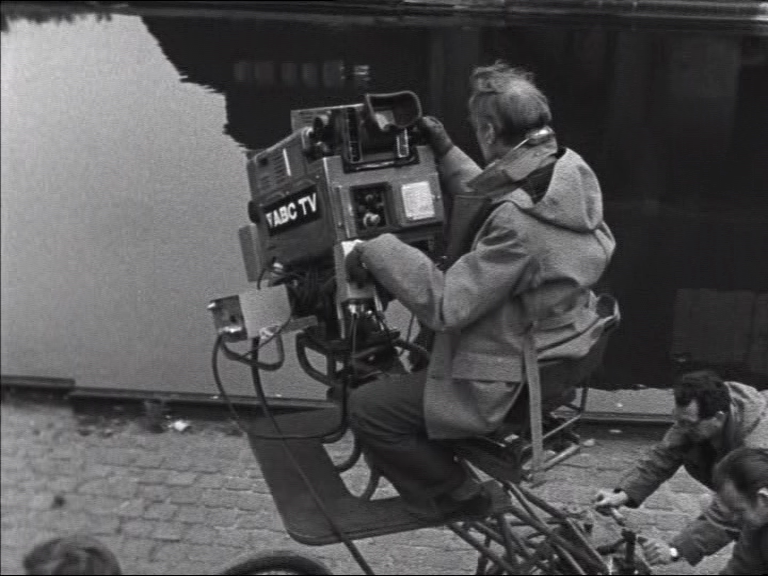 The ATV Today footage does illustrate some the limitations of Outside Broadcast recording, with the cumbersome camera equipment appearing difficult to manouvre. One of the two cameras on site attempts a mobile panning shot that requires two members of the crew to push it, and a third person to steer it. Such techniques were achievable on relatively flat and even surfaces such as canal walkways, but would have been hard to manage in bumpier or more remote locations. The narrative purpose of such a scene would have been just as apparent if realised through small cutaway set of the corner of a schoolyard in the studio, with sound effects of children playing, but the real setting provides the scene with the sense of spontaneity that Burke mentions. 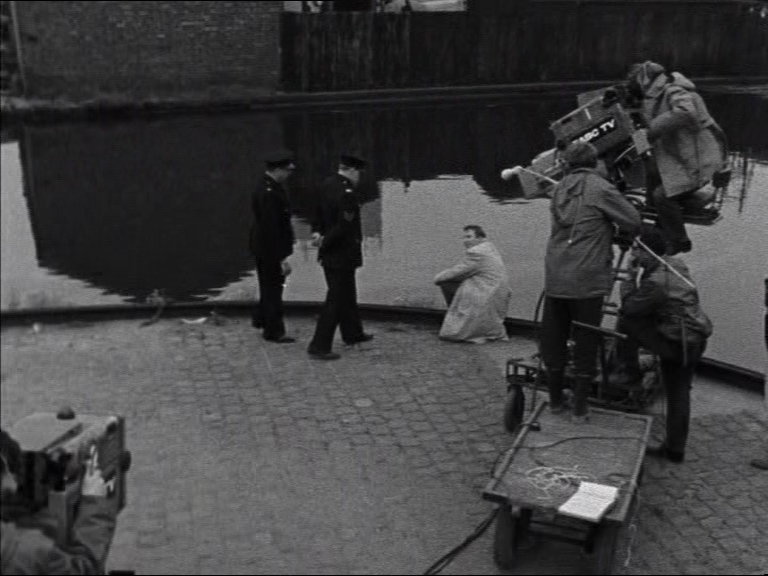 Having to speak above a noise made by the children at the same time and respond to the elements while conveying the plot means that the scene has a sense of occurring in the specific conditions of the moment, and adding considerably to the viewer’s imaginative understanding of the door-to-door work of a private detective. 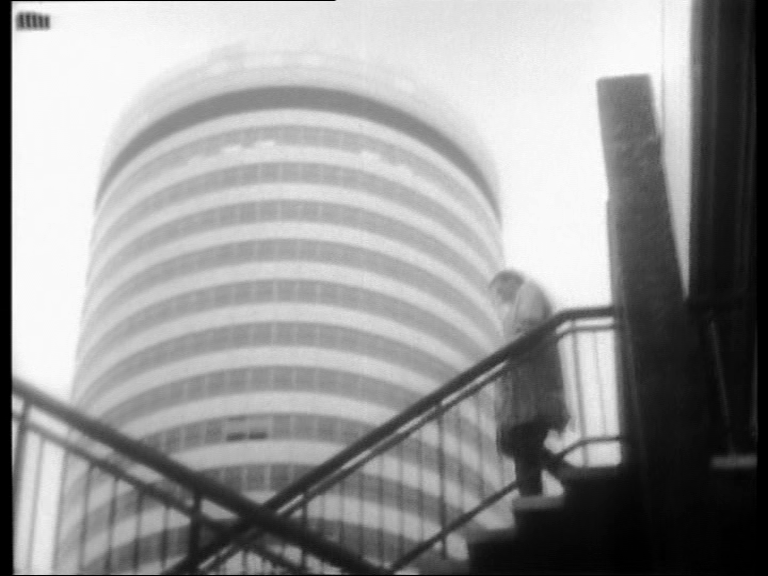 Although most of the location inserts in the episode are similarly modest scenes, the episode culminates in one highly ambitious sequence in a distinctive Birmingham landmark, when Marker sprints around New Street Station in pursuit of an endangered and unhappy girl: Enjoyable and evocative though this ambitious sequence is, it has to be said that it isn’t seamlessly integrated into the narrative of the story, appearing to come out of nowhere – the woman leaves her room and Marker suddenly tells her husband that she’s in grave danger and they must comb the streets for her, an assertion unsupported by her previous behaviour in the episode. It can be much harder to ascertain whether inserts are recorded on videotape or 16mm film in black-and-white programmes than it is for later colour ones, so my instinct that this sequence was made on both film and video can only be an informed guess. 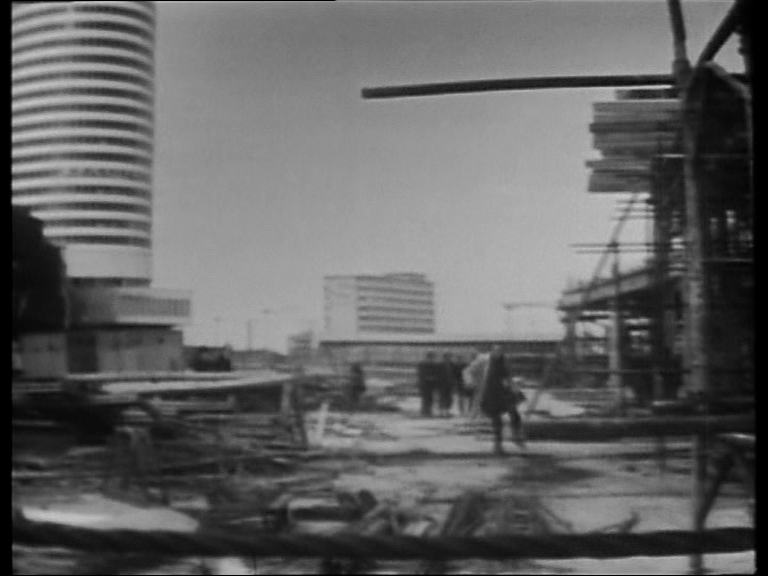 What is apparent about this scene is that it locates the programme into a precise point in space and time – Central Birmingham in the mid sixties, when New Street Station is being rebuilt, with the sight the Rotunda and the Bull Ring in the background signifying modernity and the urban to the ITV audience of 1966. This entry was posted in Series and tagged ABC, Alfred Burke, Outside Broadcast, Public Eye. Bookmark the permalink. This Excellent Underrated series Worthy ofa show on ITV 3 or ITV 4..I have Series 5 on Dvd from 1971 in colour DVD1 contains the 4 minute interview with Alfred Burke with unknown Timothy West in the background. which makes viewers sympathetic to him. If anything most of the episodes are too downbeat,but Life is tough. It is also a snapshot on changing city centres of Birmingham,London,Windsor,Chertsey. Very good series, well woth watching. Thank you for this intriguing analysis. 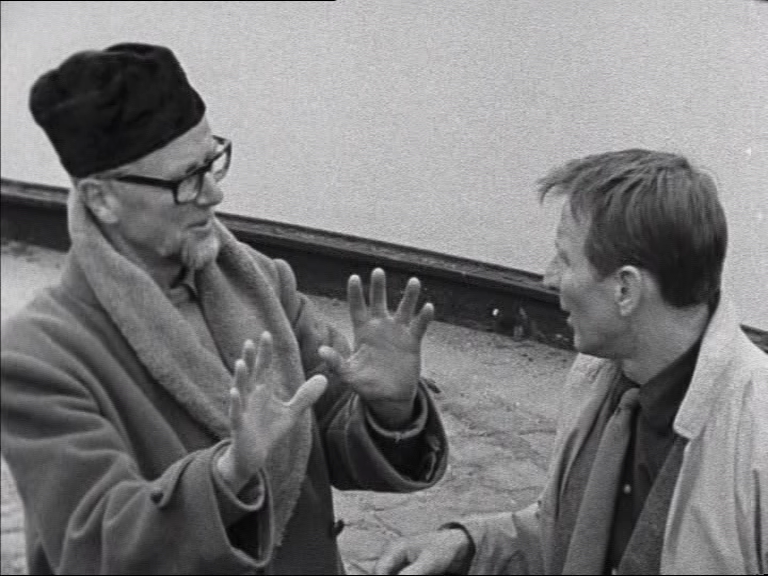 I’ve watched this footage and the interview with Alfred Burke was great to see. Despite the downsides I think he rather enjoyed location filming. I have recently finished working my way through all the black and white episodes of Public Eye. The five episodes that exist from the first three series are fantastic and make me long for more. I agree that there is a noticeable shift when Marker moves to Birmingham. The episodes seem more ambitious with more unusual plots. I would love to see more of him in Birmingham, perhaps with a few more actual Brummie accents too! Excellent blog and an excellent series. It is such a shame that so many of the early episodes are lost. Just watched ‘ Have A Cup Of Tea’ on YouTube. Great performance from Mr Burke. He’s recovering in hospital from a bad beating, and appears to be down and out. Reluctantakes on a job through Percy, and finds a young woman with a newly born baby, in parlous circumstances, at her wits end ( Rosalind Ayres ) , who’s as down as he is. An enjoyable and interesting insight into an unfairly overlooked TV series. 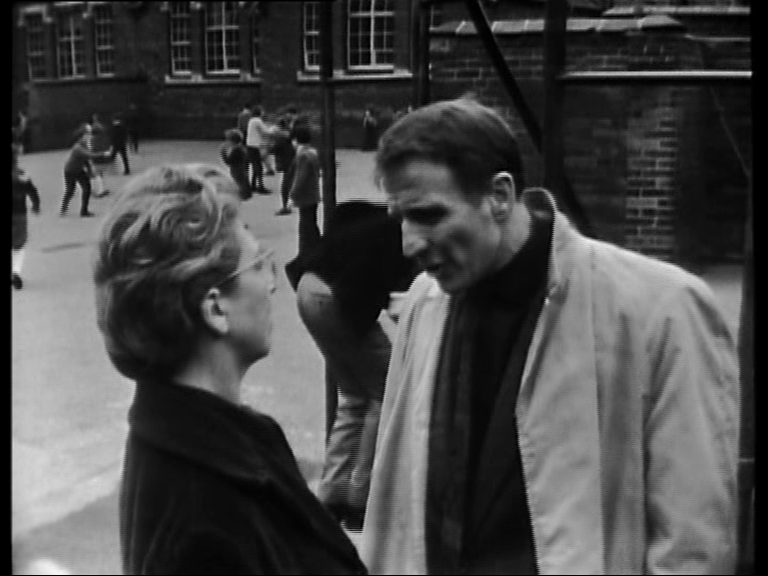 ‘Public Eye’ is the type of drama that would be unlikely to be made in the here and now; the action – such as it is, is pared down, and the central role of Frank Marker, as portrayed by the very subtle and nuanced Alfred Burke, would be difficult to cast. Besides, not having a love interest or a ‘dark secret’ would not play with the kind of audience that demands greater pace or controversy. Also, the Brighton and Windsor series have a certain visual quality – being shot on video, they have a look that’s of its time. ‘Public Eye’ is a series that has worn extremely well, and not just for nostalgia value. It is a showcase for fine British character acting, a sense of the down-at-heel and shabby underbelly of the supposedly swinging sixties and uneasy seventies, and great TV writing. A shame that so much of the early series no longer exist. Why didn’t they use film cameras for location work. You would think it would be easier and cheaper than using video cameras. Having set up an OB Unit, the amount of material that they could record in a day was considerably greater than with film. 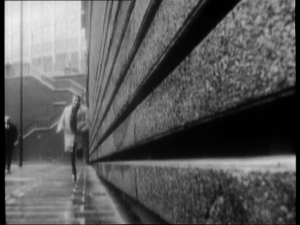 Also, when given the choice, directors often preferred the stylistic unity of matching videotaped studio interiors with exteriors recorded on video. The thought struck me, that as they already had the equipment for live broadcasts, it made sense to use it for recorded drama, rather than leave it in a Depot and not use it. Could this also be a reason? That’s true up to a point. The big ITV companies had both film and OB Units in-house that drama Production Unit Managers could use for their shows. OB crews were generally less experienced in filming drama than film ones, with most of their work coming from sports and other public events. Remember it as a youth.My parents loved it! Now I am enjoying the whole series on “whatever”channel. to that dross “Bodyguard”recently screened. I suppose its only us with some sort of taste that will continue to enjoy the adventures of Frank and also the repeats!! Absolutely love ‘Public Eye’, remember my mum watching it, I was only little,it was the opening credits i remember with Marker walking down the passage ,looking back . Now I’m enjoying the series as a big girl,what a good actor Alfred Burke was. I too am enjoying these re-runs of Private Eye. Alfred Burke’s Frank Marker character has a certain understated, laid back, typically English/British presence, which perhaps hasn’t been seen since maybe Eddie Shoestring(?). And of course very little violence is used, which would almost be impossible to encounter in modern-day tv drama! But something else, which I’ve noticed, and time after time (and I’m sure I can’t be the only one) in drama TV shows like this (from, oh, I don’t know, maybe pre-1980-something?) is the absence of music used to ‘fill-in’ all over the place throughout the story! Oh, I love music, and have many favourite tv theme scores, and do indeed enjoy music used (at certain times) for dramatic effect. But for me, personally, less music = more dramatic focus and expression. I think I first noticed this when re-runs of the (original) Upstairs Downstairs series was repeated some years ago, again, very little music, if any(?) was used during the show itself. It just seemed to draw me in to the scenes more deeply, and focus on the interaction between the characters and what the stories were trying to present. Silence can evoke much more dramatic atmosphere than sound, at the right times. Any one else feel similar to me about this?! Oops! Sorry! I got the title wrong! Obviously, I meant ‘Public Eye! What a very engaging, enjoyable and classic tv series. 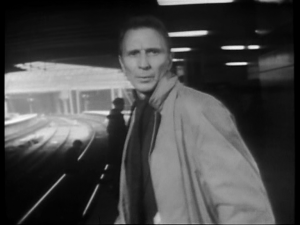 Alfred Burke excels as the Frank Marker – such wonderful guest stars , scripts and theme tune. Alfred Burke portrays the character wonderfully – I remember the original series being on TVs as a boy circa 1970 but really into it now it’s on Freeveiw channel 81 ( Talking pictures- a great channel too – I wonder if there is a fan club / appreciation society for Alfred Burke/ ” Public Eye” ??? I agree. And as his new bank manager said to another member of the bank staff, in a scene a couple of episodes back: “A ‘funny’ chap, but a nice man”. I’ll certainly miss the series when it finishes on Wednesday, 11/12/18. I haven’t searched for a fan club/an appreciation society. However, there is an extensive Talking Pictures TV Facebook site, with various pages relating to the Public Eye episodes. I, myself have contributed to some of them. Did you know that Alfred ‘Alfie’ Burke died two weeks before his 93rd Birthday – so, he had a good ol’ innings alright! Oh, also, I was given a link to an oral interview (only, no pictures) on ‘SOUNDS’ web site, with a woman named Kate Harris. He was quite old when that was conducted. I forget, I think it was recorded in the 1990s'(?). Anyway, I found it quite interesting and AIfred speaks a lot about his early theatre days, ‘though unfortunately, very little about Public Eye!